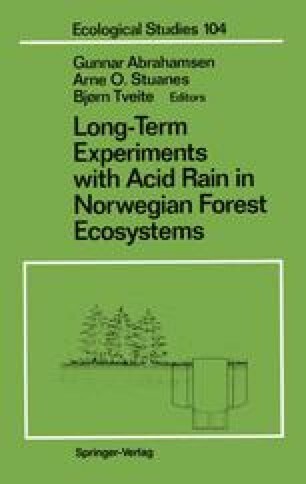 During the years 1972–1975, five large field experiments were established in southern Norway to study the effects of acidic rain on forest soils and forest growth. Three of the experiments (A-1, A-2, and B-2) were located in previously established plantations of Lodgepole pine (Pinus contorta Dougl. ), Norway spruce [Picea abies (L.) Karst. ], and Scots pine (Pinus sylvestris L.), respectively. One experiment (A-3) was established with planting, and included European white birch (Betula pendula Roth. syn. B. verrucosa Ehrh. ), Norway spruce, and Scots pine. The fifth experiment (B-2) was carried out in a 100-year-old stand of naturally regenerated Scots pine. The soils are Typic Udipsamment (A-1, A-2, and A-3) and Typic Udorthent (B-1 and B-2).